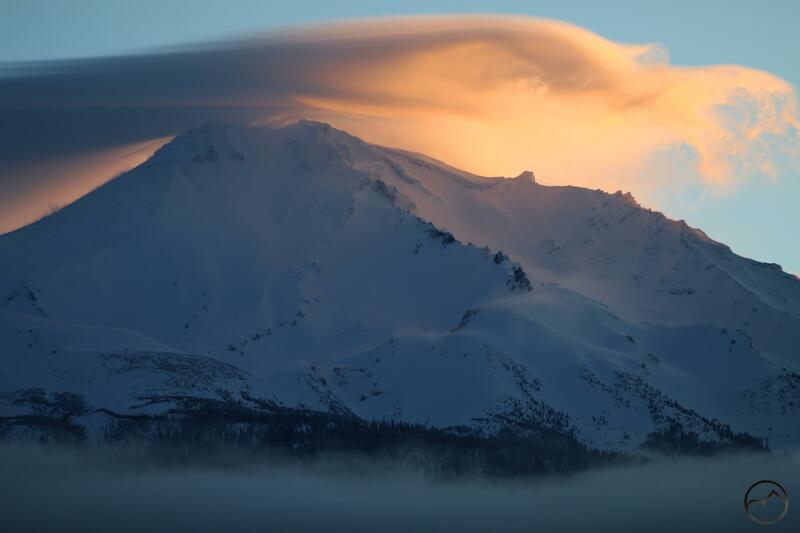 Fresh snow blows off of Mount Shasta during a winter sunrise. 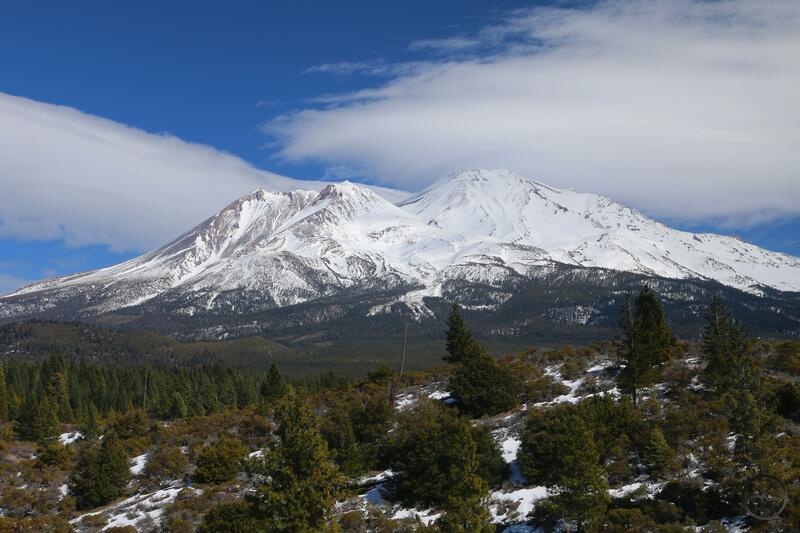 I am probably tempting fate here, but I think that, with last night’s snow, we are seeing the winter of 2017-2018’s final stand here in Mount Shasta. Looking at the forecast, the temperature is going to climb up into the mid-60’s and the sky will be clear and sunny. It looks perfect. I am sure more rain will come, but the snow, such as what fell last night, may be done. This is timely, since I, my family, and most of the people I have talked to, are ready for spring, ready to get outside in warm weather, and ready to enjoy the sun again. Last night we got about 3-4 inches of snow. I awoke early and surveyed the snow, the cloudless sky, and promptly headed out to go watch the sun come up. 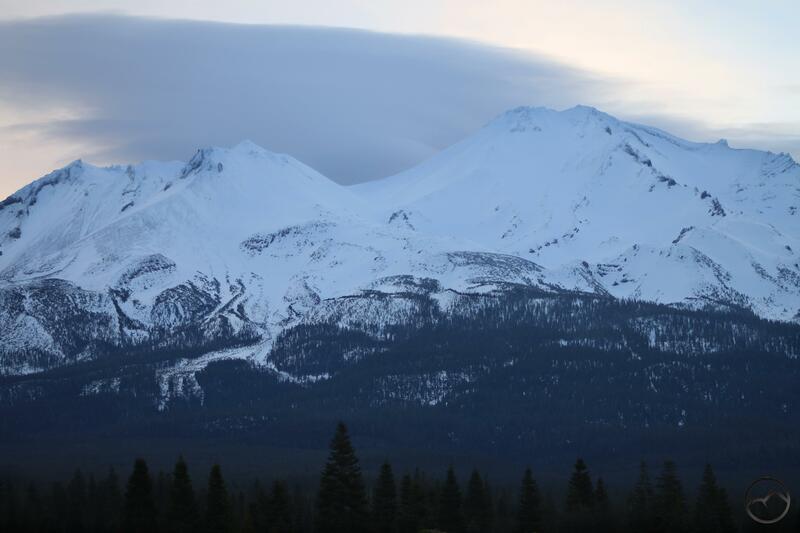 From the north, Mount Shasta is always cast in shadow at sunrise but if there are clouds, they catch the rising sun’s light beautifully. This morning was no different. This morning there were also plumes of snow billowing off the mountain, adding another layer of matter for the light to reflect off of. It was another morning to be thankful to witness. Back at my house, the snow made for one more pretty winter morning. It will no doubt melt off quickly, but my family was glad to be able to enjoy it one more time. This winter was a bit of a mixed bag. 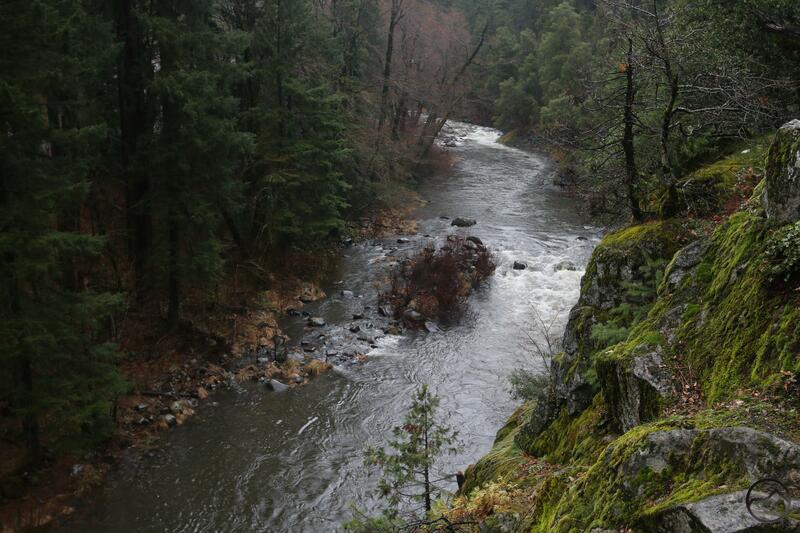 It started off fairly dry, with no snow for months. However, February and March have seen significant precipitation and one major snow storm pass through. 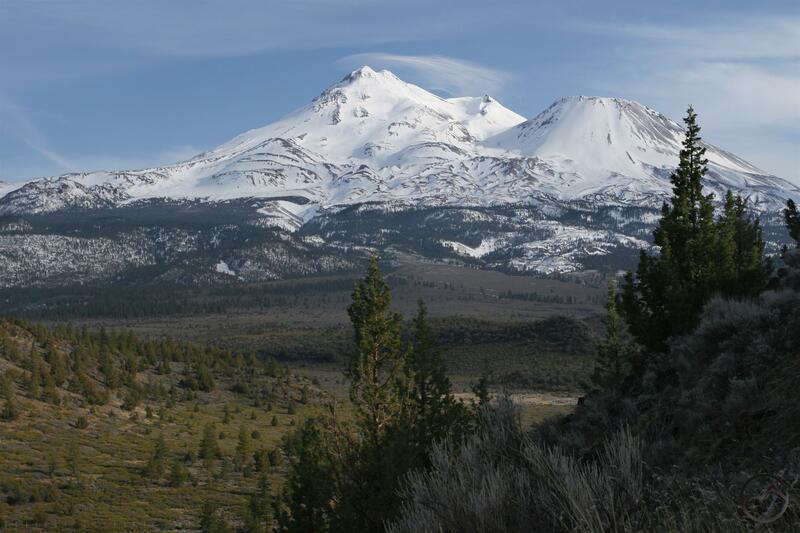 I am not sure what the final snowpack will end up being, or how much rain fell, but the latter two months have certainly meant we have avoided disaster. It was much, much better than the winters of 2013-2014 and 2014-15. The snow last night was nearly equal to the total that fell each of those years. Those were awful. So, though my writing this will likely prove responsible for more snow soon, I am declaring winter over and I am moving right into spring. I hope everyone has a great one! 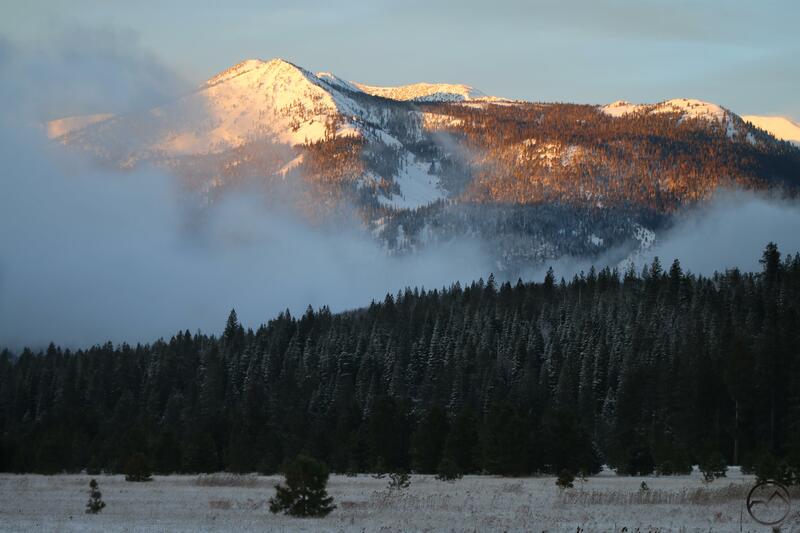 Snowy Mount Eddy catches the rising sunlight. 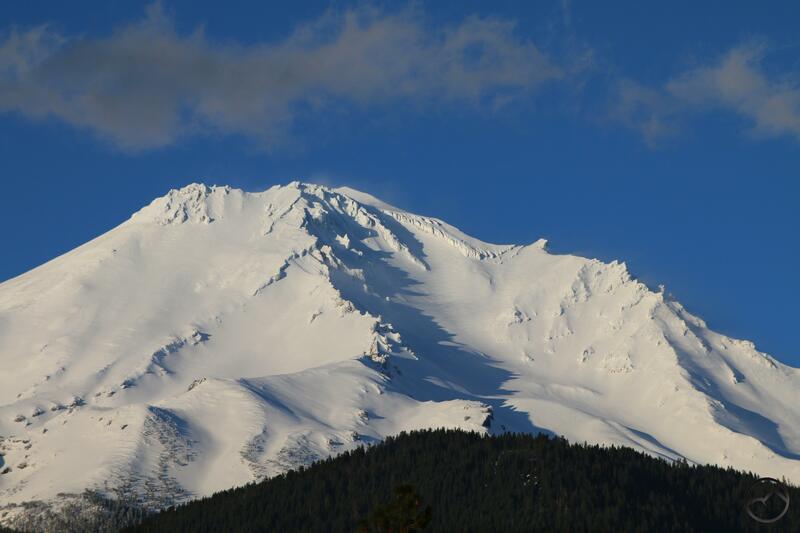 Late afternoon light on Mount Shasta. The skies have been cloudy lately and we still have up to 10 inches of snow due to fall tomorrow and tomorrow night (color me skeptical). 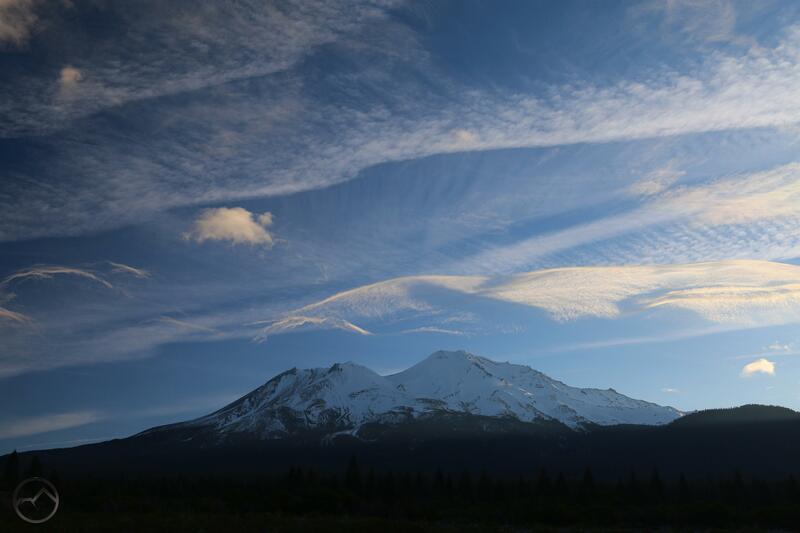 It rained hard last night and into this morning, so I was surprised when the clouds broke and Mount Shasta in all its snowy glory was revealed. It promised to be a beautiful sunset, so after dinner, I took my kids over to Sisson Meadow and let them play while I hung out by my camera. 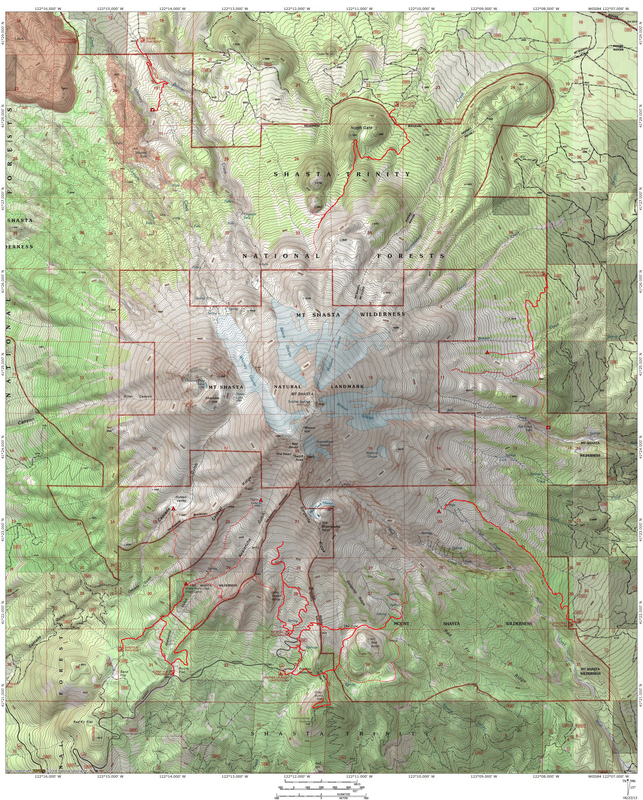 Sisson Meadow is a gorgeous slice of paradise right in the middle of Mount Shasta City. 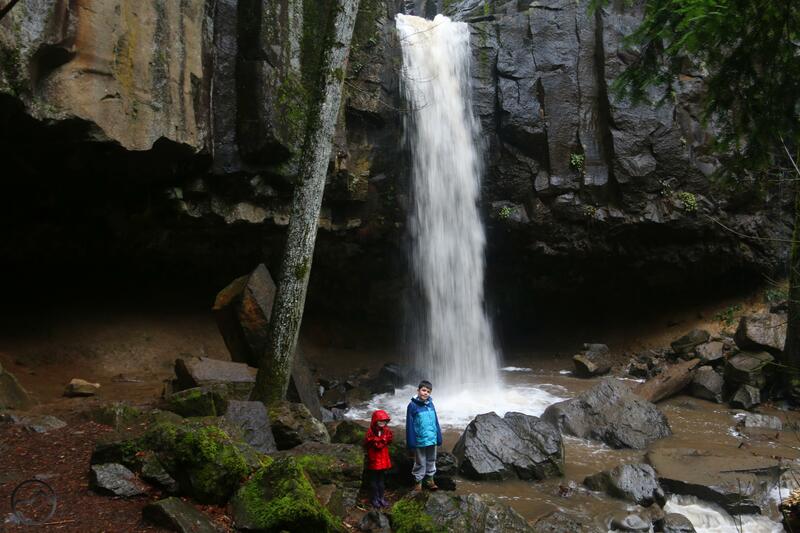 Graced with a small pond, beautiful little streams and a diminutive waterfall, it also has superlative views of the mountain from its boardwalked trails. My kids love exploring and collecting medicinal herbs (my 8 year old is obsessed with the things like teasel and yellow dock among others – go figure) and it gives me the chance to watch the clouds and wind-blown snow plumes. It isn’t the most imaginative perspective, but it works in a pinch. This evening once again highlighted the great shadows cast by Casaval Ridge. From town, the ridge does not really look very impressive, but it is obvious from the shadow that it has immensely jagged topography. To get a better view of the pinnacles, it is necessary to head north or south or go up to Bunny Flat. From those vantages, the ragged towers are quite dramatic. 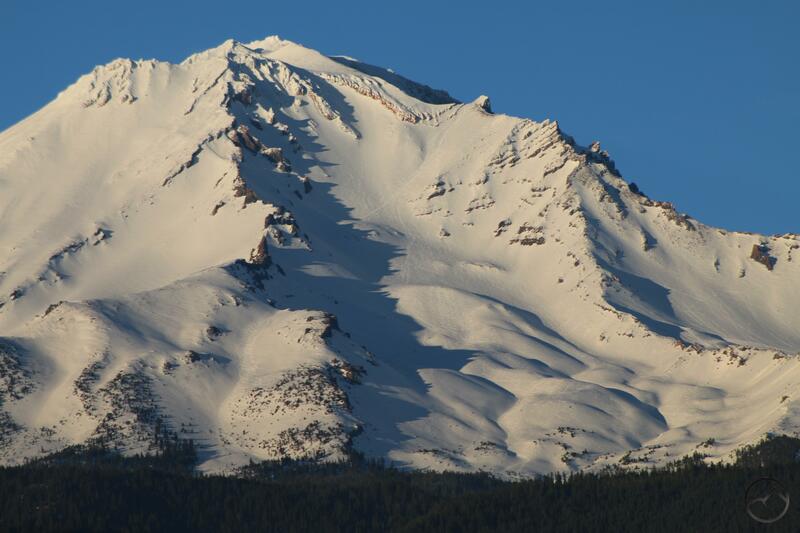 This evening, the shadow cast in Avalanche Gulch showed off the sawtooth profile. The sharp edges of the towers’ shadows softened as the sun set but the weakening of the that drama was replaced by the arrival of the alpenglow. I never tire of seeing the light sweeten on the snowy cliffs of Mount Shasta, until it it finds just the right shade of pink or orange or purple. 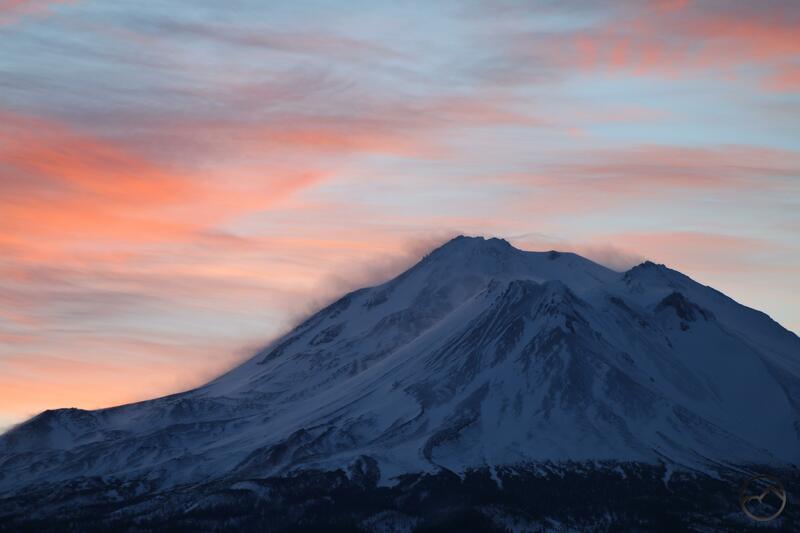 Even with a cloudless sky, not two sunsets on Mount Shasta are alike and each is to be savored.